After a very restful night at the Days Inn and a Continental Breakfast at the Days Inn, I walked over to the 82nd street Max station and purchased a Day Pass for my free day of fun in Portland. I rode east to Gresham where I boarded a waiting trolley to Hillsboro. 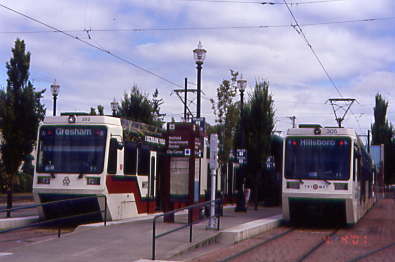 At Hillsboro I took a picture of the trolley on the right which brought me here and the one on the left which will take me away. 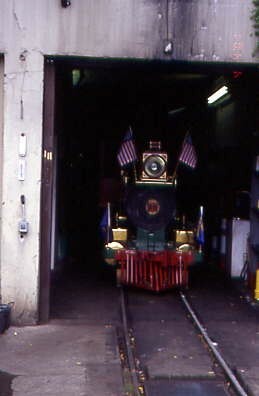 I boarded the waiting trolley for the trip to the Washington Park Station deep inside the Robertson Tunnel. I took the elevator 243 feet up to the surface. 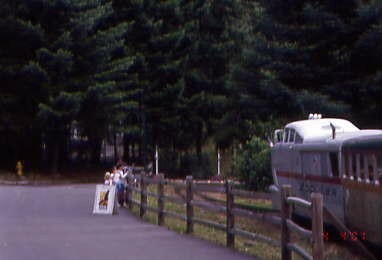 Across the street was the entrance to the Portland Zoo. 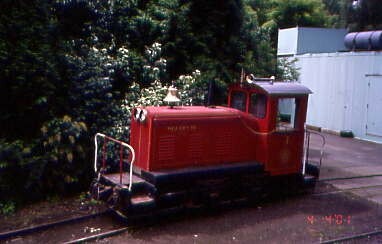 I had to pay admission to the zoo in order to ride the train. After I waited for a tiger to finish cleaning himself, I walked to the Station to wait to board the train. 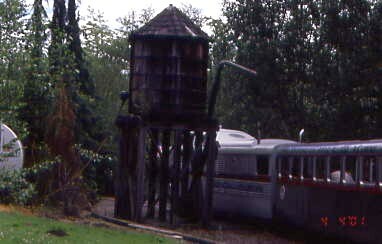 The Aerotrain came out of a tunnel and into the station. As I had my ticket taken I told the crew member that I was from Trainweb.com and was writing a story about my trip. 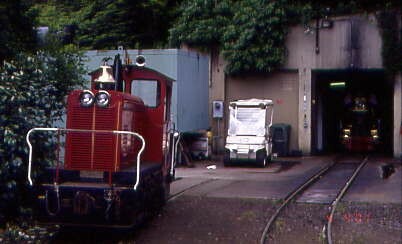 He told me to meet the engineer after the trip but I could walk to the front and get a shot of the train at the Zoo Station. 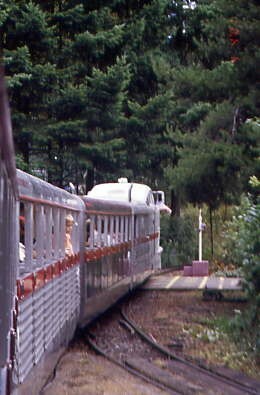 I boarded the train and after putting my bag down took this view of our train preparing to leave. I walked up to the front of the train for this view. After a few pictures I returned to my car for my trip on this unique railroad. 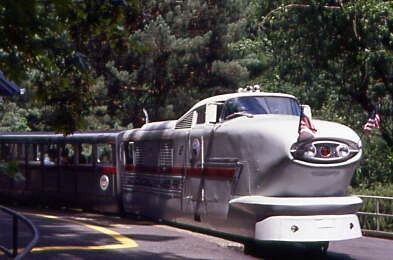 The Zooliner 2 was built in 1958 as a replica of the General Motors Aerotrain. 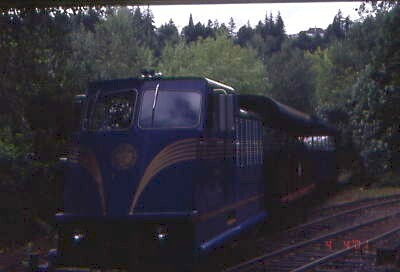 We left right on time at 11:15 AM and passed the Oregon Express waiting for its next chance to run. 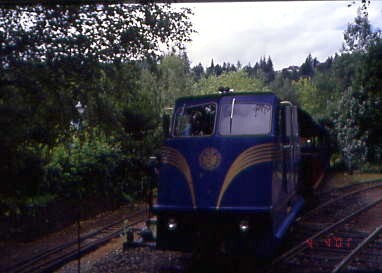 The train ran beneath the main bridge into the Zoo before making its way across the grounds until it passed through a gate and out into Washington Park. 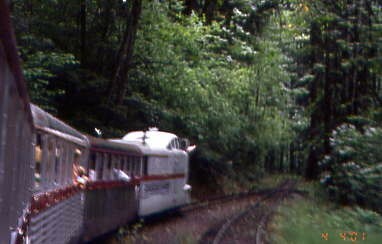 The train run through the forest, twisting and turning along the hillsides. 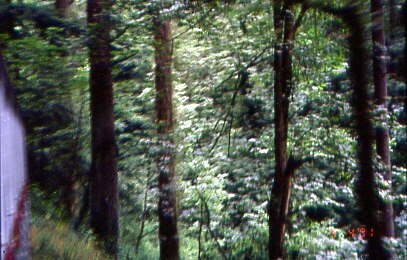 Glimpses of downtown Portland could be seen through the trees. 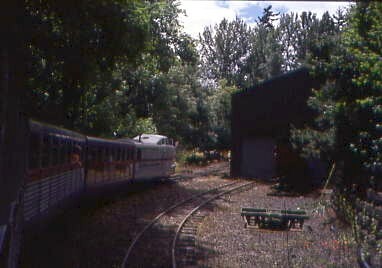 There are two passing tracks on the way to the Rose Garden Station. 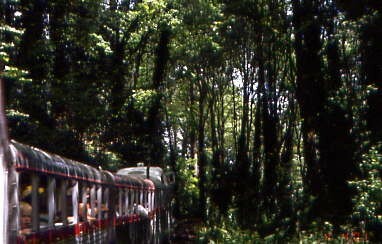 More views of the Zooliner passing through the very unspoiled forest. 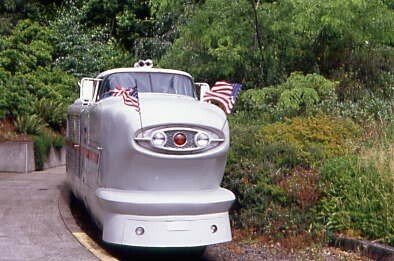 The Zooliner pulled into the Rose Garden Station. Here I got off for a minute. 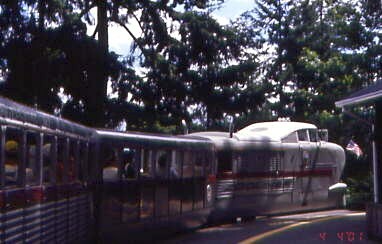 The Zooliner at rest at the Rose Garden Station. We returned to the Zoo but took a new route once we got inside. On the return trip we passed the Main Shops before passing the Elephant Exercise Area looping around and passing it again before we returned to Zoo Station. I detrained and thanked the train crew for a fantastic trip. They then offered me a chance to walk up to the shop to see and take pictures of anything I wanted. 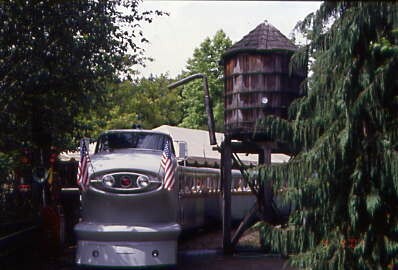 The Oregon Express was rebuilt in 1991. 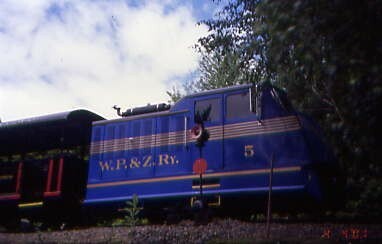 Washington Pack and Zoo Railroad Shops. The "Oregon" Steam Locomotive 1 built in 1959 for the Oregon Centennial a replica of the "Reno", a Virginia and Truckee Railroad engine. I thanked the train crew for everything included my private shop tour. 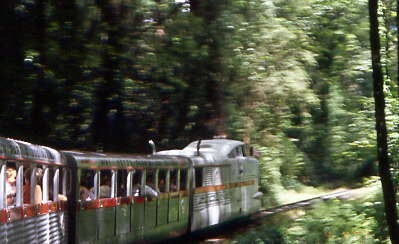 I visited the Zoo Gift Shop before returning down into the Robertson Tunnel where I took a trolley back into downtown Portland. I got off the trolley at 10th and Yarnhill to walk around the corner to wait for the Downtown Streetcar. I boarded a crowded Skoda Streetcar from the Czech Republic with many other people at the Portland Library Stop. Most were heading to restaurants for lunch. I had other motives for being here. 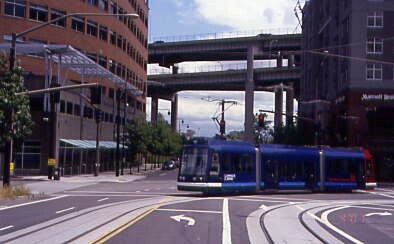 Since my last visit to Portland they have extended the Portland Streetcar to the River Place. I found a seat and rode north then west to the Good Samaritan Hospital. 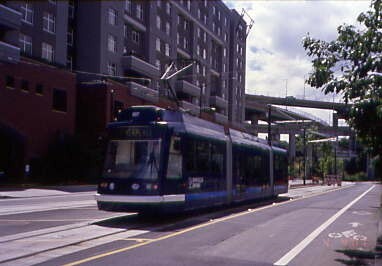 Returning east then south through downtown to the former end of the line at Portland State University. The extension opened in early 2005. My new trackage started as we turned left onto SW Harrison Street with new stops at SW 3rd and SW 1st. We turned right above SW Harbor for the River Place Stop. We descended the hill making a left at the bottom onto SW River Parkway. The Portland Streetcar dropped me off at the River Parkway/Moody Station. The Portland Streetcar dropped me off at the River Parkway/Moody Station. 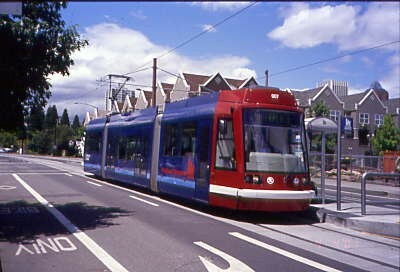 The streetcar then turned onto SW Moody Street so the operator could switch ends. The streetcar returned to the station to pick the waiting passengers up. 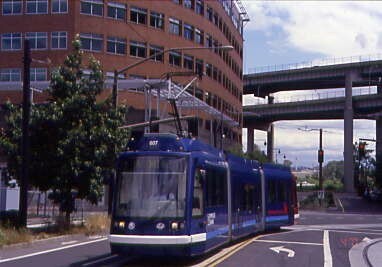 I returned on the Portland Streetcar to the Library Station where I transferred to an Airport Line Trolley for my trip back to 82nd Street and the Days Inn. This hotel is the place to stay for a visit to Portland. Rates are excellent and across the freeway Elmers will keep you well feed. Also next to the Max Station the Union Pacific Gresham Line runs with several trains a day passing by. I could see them from my room when I was there which kept things interesting. I relaxed in my room before I went to Elmers for another Prime Rib Dinner before packing up for my trip home via Tacoma and Seattle.